The introduction of the Opel Vivaro in 2001 marked a turning point in the commercial vehicle world. It was the first time that an automobile manufacturer was able to successfully marry aesthetic appeal while notably maximizing the usable cargo space. Opel created a sleek looking, big van with extra load space and driving comfort. The 2014 model only strengthened all the positive features of the previous Vivaro models. 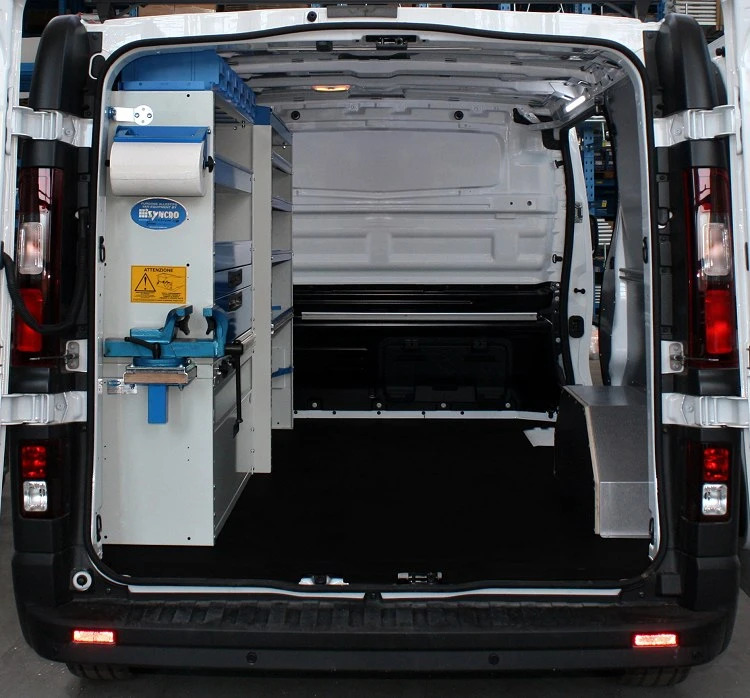 As always, the Syncro group, quickly mobilized to provide its clients with all the components to be able to transform the Vivaro into an efficient and practical working van. In our catalogue, you’ll find floor panels, interior linings, loading ramps, roof racks, ladder racks and a wide range of shelving and drawer components, as well as lots and lots of useful accessories. 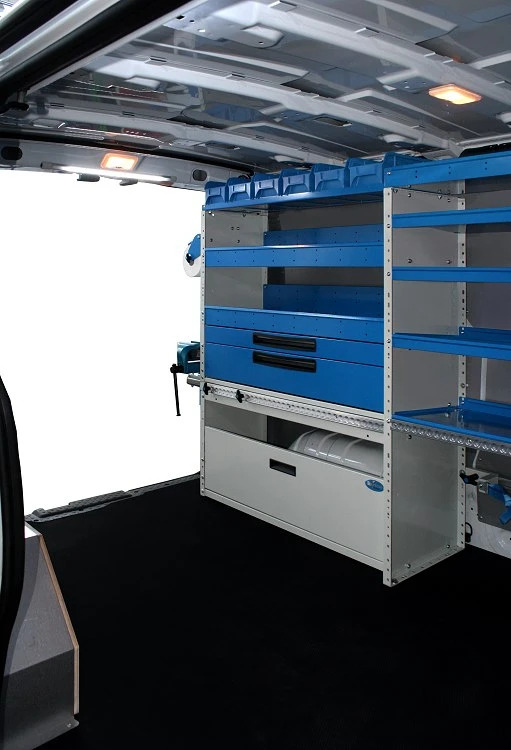 Really everything you need to transform your Vivaro into a fully functioning mobile workshop. 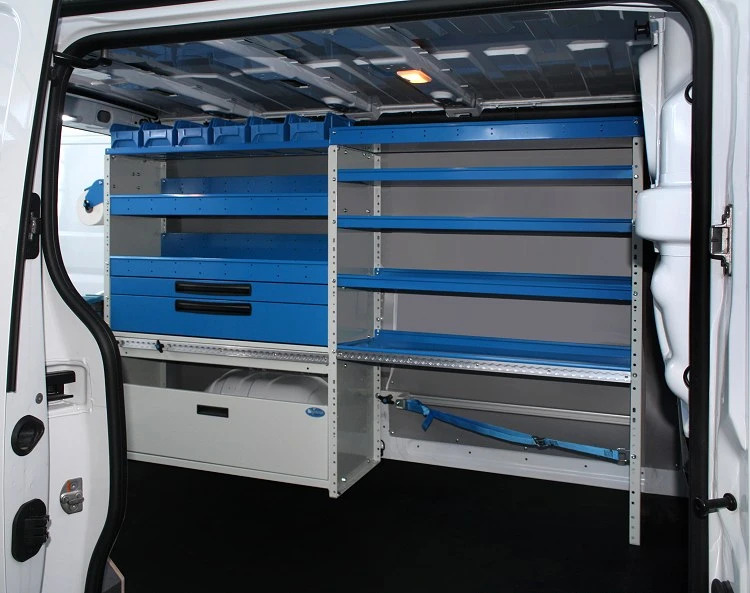 On this page, you can see a conversion solution for the 2014 Vivaro with left-hand side shelving, protective paneling, and accessories. From the bottom up, we start with the time-tested, resin-coated plywood floor panel. 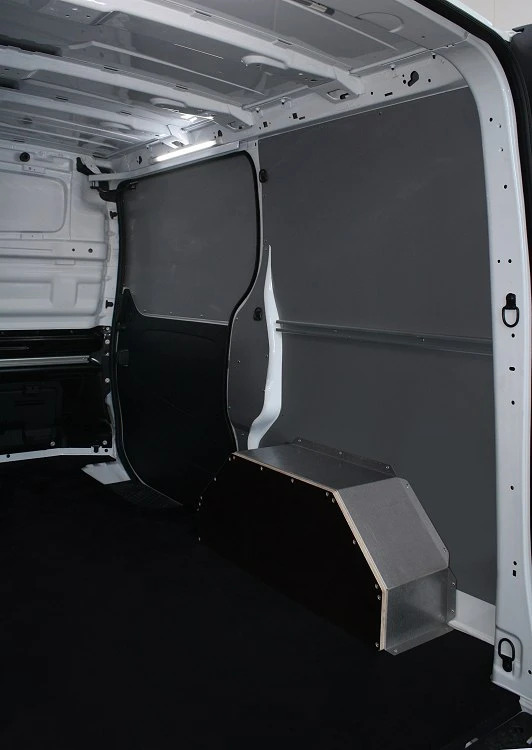 It has the triple job of protecting the original van floor from dents and daily damage, creating a sturdy flat loading bed, and providing a solid surface for mounting the racking components. The walls have been protected by pre-coated, laser-cut, galvanized steel paneling, creating a clean professional look while protecting the original surfaces against damage from denting caused by loading and unloading cargo. The wheel arch on the right-hand side is protected by a galvanized steel and marine plywood wheel arch cover. The racking solution on the left-hand side consists of two racking combinations of different depths. The outer part is 353 mm deep. 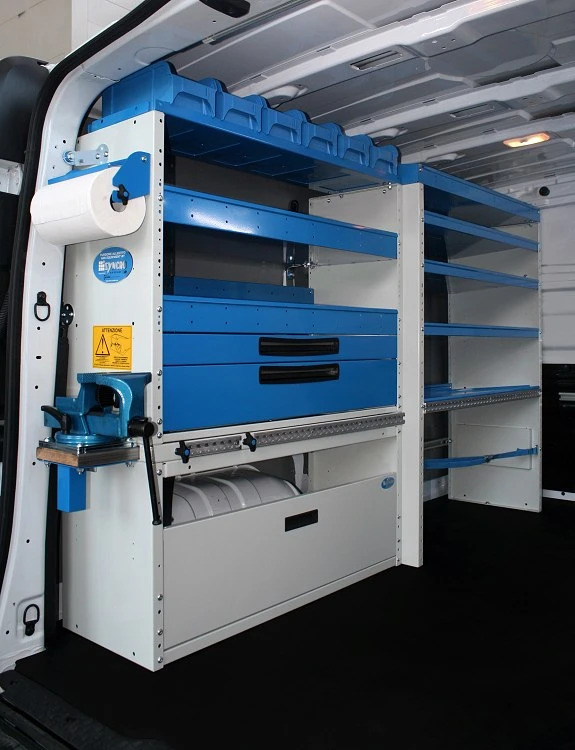 The bottom compartment has a door panel equipped with the patented rotational hinge system, allowing ‘wide-open’ access to the interior storage space. Above the wheel arch frame, Syncro technicians mounted a pull-out worktop / vise base, complete with 125 mm forged steel vise with rotating base and steel pipe jaws. With the worktop pulled out, it is possible to attach an extendable support. Above the vise base, we placed two steel drawers, mounted on telescoping ball bearing slides, complete with rubber mats and aluminum dividers. Continuing upwards, we see two shelves, which also come with rubber mats and dividers. At the very top is a steel bin shelf, complete with six plastic bins – all removable and transportable. The racking components closest to the bulkhead have a depth of 410 mm and are used to store cases and organizers. At the bottom, there is an adjustable, locking shuttle that slides along an aluminum track, complete with strap, to ensure safe transport of cases of all sizes. Moving up the racking unit, we placed four forward-sloping shelves, where more cases can be stored. The shelves are all equipped with individual locking mechanisms to ensure cases won’t shift during transit. At the top, we find a final shelf with dividers. To enhance the utility of this conversion, we added some valuable accessories. There are two compact, yet powerful LED ceiling lights positioned above the van doors, plus a paper towel roll holder (for 230 mm rolls). For tying down all kinds of materials and equipment, we mounted aluminum tracks, complete with straps and clasps along the free wall space, and two more mounted directly to the racking units. Once again, the Syncro Team was able to work with our client to create an ideal conversion for this Vivaro – allowing work to be carried out more quickly, efficiently and safely.